As lupus patients, I hate to say, we have experienced more emotions and feelings than most others we know. I hate to say this because when I think I have it all under control I find a new feeling or emotion taking over. I hate not being in control. A week or so ago I was at the office preparing for the Awareness Walk. Sure I had a lot to do. That’s my norm. You bet I was feeling pressure. But this day would bring about feelings and occurrences that I had not experienced before. In the middle of the chaos someone began chatting with me about things other than what I was doing or the walk. I gave them the death glare. That did not help and the chatter continued. I stopped what I was doing and attempted to reply to whatever they had asked. I was not successful. Words would not form in my brain and what did sounded like jumbled letters as they tumbled from my mouth. I wasn’t having a stroke. I wasn’t having a TIA. I was F-R-A-Z-Z-L-E-D. I quickly realized I had not been frazzled in a very long time, if ever. It’s not a good feeling. I didn’t know what to do. I couldn’t speak, and yet I still had a million things to do. Finally I muttered, ‘shut up.’ The look that was returned to me was one of astonishment. It took a couple minutes of quiet before I could explain. When I did I’m not sure the other person completely understood, but that didn’t matter. What mattered was that I moved on to the next task and regained a modicum of control. Merriam-Webster.com defines frazzled as ‘to be put in a state of extreme physical or mental fatigue.’ Paint me frazzled. I had so much going on I didn’t know which way to go, what to do next, nor was I able to ask for help. 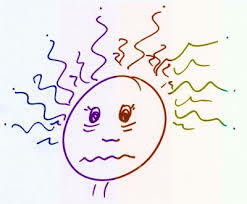 As lupus patients it’s too easy to become frazzled. Trying to juggle all of the appointments, the medications, the information would be enough to frazzle anyone. Add to that family, work, church, our home, and the things we do for pleasure and frazzled might become our daily companion. To aid you when feeling frazzled, or to help you not get that way, here are a few suggestions, beginning with what I had to do to stop the frazzle fire. It doesn’t matter what you are doing, it’s not as important as your health and well being. STOP. Take a few seconds, or minutes to clear your mind so you can move forward. Oxygen will help clear the fuzzies and frazzles from your brain. Stop. Breathe. Think of nothing. DO NOTHING. For some of us this is tantamount to blasphemy. Do nothing you say? I can’t. I don’t know how. I haven’t done nothing since I was two. DO IT ANYWAY. Stop. Breathe. Do nothing. Let your body and mind recover. That’s right. I said laugh. When I began to speak gibberish my first reaction was to over react. To become angry at the interrupter. To blast back. But after a couple seconds I was able to hear myself in my mind. It was funny. I sounded like an over heliumnized clown. Laughing causes us to take in more oxygen, to see things as they are seen by others, and to let go of the tension. LISTEN TO MUSIC. It doesn’t matter what, but the faster the better. It has been proven that listening to music can change our moods. At this particular time I wanted to listen to Carla Ulbrich’s song, “If I Had the Copyright.” Carla sings about living with lupus, but she does it with humor and hysterics. If I wasn’t laughing before hearing her song, I certainly was after. COUNT YOUR BLESSINGS. No matter how bad things feel or appear, there are blessings there too. Be thankful you have a job. Appreciate that you are able to do these things. We all have blessings and should be grateful for them. SAY A LITTLE PRAYER. Whether it’s a prayer for help, a prayer of thanks, or a prayer of letting go, simply acknowledging that the problem exists and there is a higher power to help us may be our saving grace in the situation.